Aspire Oklahoma is a limited liability corporation based in Enid, Oklahoma that uses the principles of Applied Behavior Analysis. Its owner is Sandra Reese-Keck, M.Ed., BCBA, ABSNP. 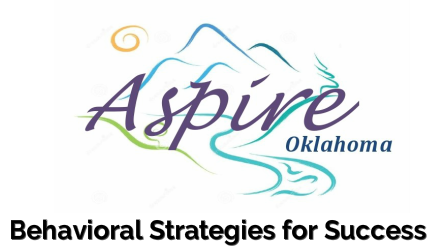 Aspire Oklahoma will contract with Interventionists to provide direct services to select clients as determined by the managing members. All Interventionists must be trained in the principles of ABA. Aspire Oklahoma is a service-based business. The clientele will include any individual, group, or agency seeking to understand and address the effects of behavioral issues on one’s daily functioning. This may be a child with autism and his/her caregivers, teachers who are experiencing behavior problems with students, agencies who are already providing services for a similar population, adults whose behaviors are negatively impacting relationships or work, and parents desiring to improve their children’s behavior. Aspire Oklahoma provides a variety of ABA services. There can be individual and group client services, individual and group parent training and support, training and consultation for agencies and schools, play and social skills training for individuals or groups, and supervision for licensure BCBA or BCaBA candidates. Services are designed based on assessments and customized according to the needs of the group or individual. Ongoing evaluation is conducted in order to determine the success of the services and to design changes in programming. Aspire Oklahoma provides a spectrum of services ranging from intense one-on-one intervention to consultation, as needed. Initially, services will be home-based or onsite at schools or other agencies. Group trainings might also be provided in cooperation with Autry Technology Center. Future plans are to relocate Aspire Oklahoma to a freestanding center. This move would allow for expansion of services such as after school services for children and center-based ABA services. Increasingly, problem behaviors are causing more interruptions in the daily lives of individuals both personally, academically, and professionally. The use of ABA techniques enables people to change these types of behaviors. Research shows that the incidence of autism in particular is on the rise and ABA is the most effective method of treatment. ABA, once considered an “educational therapy” has now been designated a “medical therapy.” Healthcare is undergoing constant revision that will give more people access to services.